The US space agency (Nasa) is planning two emergency spacewalks to repair the cooling system on the International Space Station (ISS). A pump module in the cooling system failed dramatically last week, forcing crew to reduce power on the space station. Astronauts will need a minimum of two spacewalks to remove the failed ammonia pump and replace it with a new one. The first of these is scheduled to take place on Friday. The three Russian cosmonauts and three Nasa astronauts aboard the station are not in any danger, the US space agency said in a statement. At the Neutral Buoyancy Laboratory (NBL) in Houston, two astronauts have held dry runs for the spacewalks where they choreographed what would need to be done outside the ISS and worked out how long it might take. After practising the steps needed to remove and replace the failed unit, Nasa gave the green light to ISS astronauts Doug Wheelock and Tracy Caldwell Dyson to start the first spacewalk on Friday. Without thermal controls, temperatures on the ISS's Sun-facing side can soar to 121C (250F), plunging to minus 157C (-250F) on the dark side, Nasa says. The first spacewalk will focus on removing the failed unit. Once it has been removed, the two astronauts will have to move a 355kg (780lbs) spare unit about 10m (30ft) in order to insert it into the gap left by by the defective pump module. "This is a big, unwieldy object, so manoeuvring it around and handing it off to crewmembers... could take some time and a lot of focus," said Courtenay McMillan, the spacewalk flight director for this ISS mission. The crew faces a very short lead time - less than a week - for such a challenging spacewalk. Nasa usually takes two weeks to prepare for a spacewalk to fix a "Big 14 failure" when a major unit stops working. Mike Suffredini, manager of the ISS programme for Nasa, said that this problem did qualify as a Big 14 failure, but added that the agency was prepared for it. "This is an anomaly we knew someday would happen," he told the AFP news agency. It's an anomaly we've trained for, it's an anomaly we've planned for, it's obviously one we've spared for. So we're in a good position to solve this problem. "But it is a significant failure, in terms of systems on board ISS. So it's one that we have to get after." If the second of the two ISS cooling units were to fail - a highly unlikely scenario, according to Mr Suffredini - then the astronauts would no longer be able to cool most of the components on board the space station. The crew would not be in immediate danger, however, as they could move to the Russian segment of the ISS, which has its own cooling system. 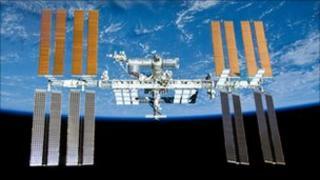 No space shuttle visits to the ISS are planned before November.